Jack Skellington, the Pumpkin King; the prized figurehead of Halloween Town, adored by the public and held in high regard in all aspects. As his name suggests, he's a skeleton, incredibly flexible due to not being weighed down by flesh, and dressed in a prim black and white striped suit. Saying he's popular would be an understatement; he's revered to the greatest extent anyone could be, like a deity personified. Jack has a great plan in store for this year's Halloween: a Heartless Halloween Festival. Since they first arrived in town, he's been fascinated by them, so much that he wants to incorporate them into the celebration. He and Dr. Finkelstein are working together to create a heart for the Heartless so that they will dance properly, but even after its construction, the heart doesn't appear to work. His work comes to stop when the heart is stolen, and he enlists the help of Sora, Donald, and Goofy to aid him in its recovery. With their help, he makes his way to Oogie Boogie's manor, taking down all who stand in their way so as to prevent him from using the heart for his own selfish purposes. However, even after the battle, it appears that their experiment was a failure, and he has no choice but to cancel the plans for the festival and make new ones. Staying positive as always, he doesn't let the disappointment get him down, and already had new preparations in the works for Halloween. Jack Skellington is the closest to a celebrity you can get in Halloween Town; as tall as a skyscraper, as lean as a bean stalk, as stylish as a New York gangster, this skeleton is the famous Pumpkin King, ruler of all that is scary and fiendish - but surprisingly, under his frightening façade, he is quite a nice fellow - albeit quite brash - and always has his friends at heart. Jack's fascination with all things Christmas starts as he wanders around the Hinterlands and finds a Christmas-tree shaped door, through which is the legendary Christmas Town, home to the icon whom Jack coins as ‘Sandy Claws'. Jack's awe at Sandy's way of life inspires him to bring Christmas to Halloween Town, a display with which he meets his old friends Sora, Donald, Goofy and Jiminy. The events that follow involve Jack helping Sora and the others rescue a kidnapped Santa from Oogie's clutches and seeing an end to Oogie. During Sora's second visit, Jack is still clinging onto his dreams of Christmas and finds himself suspected of stealing Santa's missing Christmas presents. To clear his name he devises a plan to capture the real thief whose identity is revealed as Dr. Finkelstein's experiment. After defeating the experiment, Jack says goodbye to his visiting friends and gets a taste of riding on Santa's sleigh as a reward for all he has done. 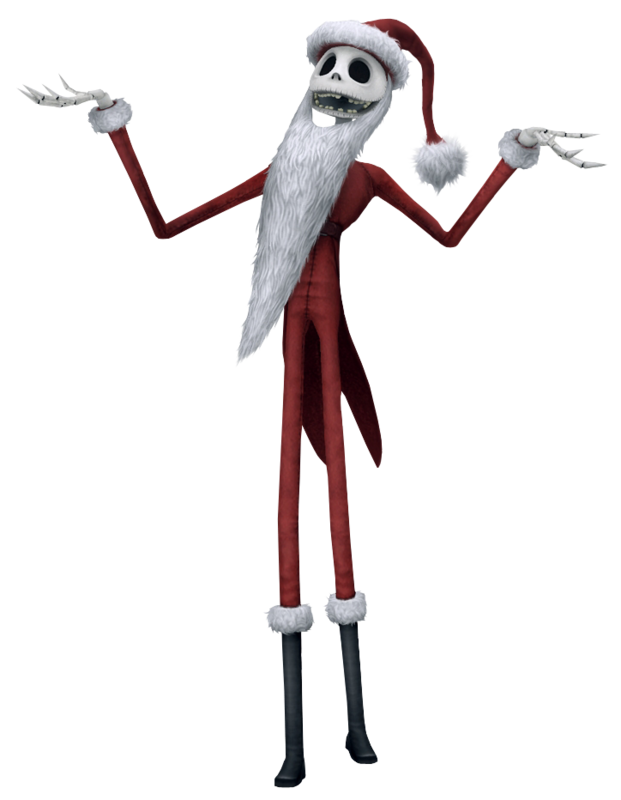 As the master of terror and the de factor leader of Halloween Town, Jack Skellington is responsible for planning the town's Halloween festivities, and is constantly coming up with fresh and exciting ideas in order to outdo the previous year's celebrations. A bold risk-taker with a penchant for grand, dramatic gestures, he will go to great lengths to achieve the ultimate Halloween party, even if the ideas he uses can seem strange and foreign to some. It's business as usual for Jack when Roxas arrives to Halloween Town. Intrigued after watching Roxas's activities from the sidelines, Jack becomes influenced into creating Halloween decorations modeled after the sneaky Organization member, including a grotesque statue built in Roxas's image. However, Jack remains unsatisfied and thus continues his search for truly shocking Halloween creations.